Here's an episode I always remember being ambivalent about. It's one of those situations where it always seemed like it was something I should like, but somehow it never quite clicked with me for one reason or another. 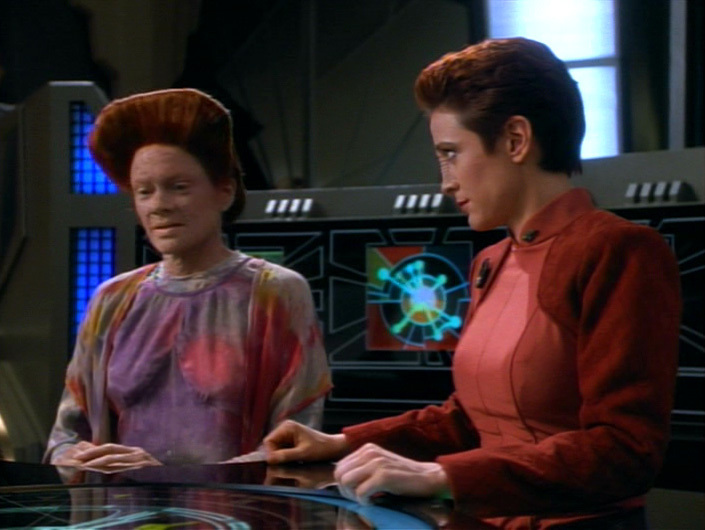 Each time I would rewatch this episode (or, given where it falls in the year and the fact it's a Star Trek: Deep Space Nine episode more generally, re-read) I would expect it to be good given my mental sorting algorithm filed it away as part of a stretch of episodes I'd just accepted as classic outright, and then I would always leave it feeling vaguely unsatisfied for reasons I couldn't quite put my finger on. Well, the same thing happened this time, except now I know exactly why this episode has never struck a chord with me. “Sanctuary” is ostensibly trying to Say Something Important about the plight of refugees, a humanitarian crisis that's sadly just as pressing as I write these words now as it was in 1993, if not more so. This means of course it's an “Issues” story, and we've just come off of a stretch of episodes that have proven pretty conclusively that “Issues” stories simply do not work in Star Trek in spite of what everyone thinks. Even though its cause is a just and noble one, “Sanctuary” doesn't work any better than “Force of Nature” or “Melora” (indeed, those episodes' respective causes were every bit as just and noble as this), and in fact it's “Sanctuary” that casts into light even more stark why this kind of morality play is a bad fit for Star Trek: The Next Generation and Star Trek: Deep Space Nine. 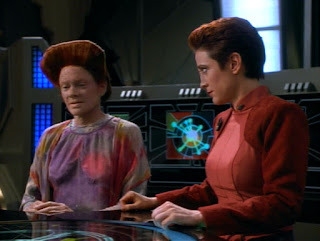 It's not, it should be stressed, that the depiction of a refugee crisis in this episode is a poor or ill thought out one: Indeed, the depiction is, if anything, depressingly realistic: Deep Space 9 becomes a staging ground for millions upon millions of starving and displaced refugees escaping oppression in their homeland. They've made a harrowing journey across great distances and the only thing that's kept them going is the hope that their new home will afford them the realised dream of freedom denied them where they come from. But once they arrive, they find locals whose attitude runs a gamut between reluctant to help and outright bigoted and contemptuous. There's even the reveal that the Skrreeans (which, as an aside, is a name for a fictional culture right up there with BeBeBeBeque in terms of sheer trollishness) see Bajor as their own holy land, a forsaken planet they are prophesied to bring light and hope back to. Which is of course a plot point clearly reminiscent of a certain real-world political situation in the middle east. But though there are parallels between the plight of the Skrreeans and the great western identity crisis that is the Israeli-Palestinian-Christian conflict, the clearest connections are to the history of the United States, which “Sanctuary” has pegged depressingly well. Although it talks up its alleged heritage as a country built on immigration as part of its national jingoistic ego, the United States actually has a long history of treating those same immigrants with distrust, fear, scorn and disdain (this is true of all nation-states to some degree or another, though I suspect it's especially true for the United States), typically subjecting them to dehumanizing apartheid-like living conditions and social structuring. The first and greatest sin of the United States is of course slavery and a slave economy, where entire ethnic groups were involuntarily relocated to the country and treated as property. But the trend continues throughout the country's entire history, as each new and distinct group of immigrants faces oppression and discrimination: Catholics, the Irish, Jews, the Japanese, Arabs, Mexicans, Muslims, and so it goes, seemingly without end forever. This is, of course, on top of the genocide the country enacted on the native peoples of North America, whose homeland they conquered and stole from them: There's not an Other that can be invented the United States can't be taught to hate. And you don't have to be descended from colonial landed gentry to be swept up in this. I've personally witnessed some of the most fervent xenophobic and nativist rhetoric in the United States espoused and supported by the last people you would normally expect: Immigrants themselves, their families and their descendants. Why would such people, some of whom have a history of being a refugee and fleeing from oppression within living memory, gravitate to these kinds of beliefs? Because the United States encourages tribalism above all else. That's a loaded term I don't use lightly-In anthropological rhetoric the word “tribe” is firmly deprecated, but in the more general colloquial sense I think it's suitable to describe the way people in this country tend to form communities based around pre-existing identities and cultural boundary lines. And, far from “starting a new life”, those communities retain their old prejudices and alliances. The logic for many people seems to go that “The American Dream” is fit for people like them [say, immigrants of a certain ethnic group” and “Americans” who were born here (that is, descendants of colonialists, landed gentry and those who have capitulated and assimilated)], but not for anyone else, regardless of how similar their situations might otherwise be. So in that respect it makes perfect, albeit sad, sense that the Bajorans, who themselves have a long history of being forced into refugee camps by the Cardassians, would turn up their noses at the Skrreeans and turn them away. I've seen it in my own life, and I see it every day on the news. This, however, gets at why “Sanctuary” is ultimately a poor Star Trek: Deep Space Nine episode. Because, ironically enough, it depicts a refugee situation too realistically. There's no utopian solution offered, and the worst part of it is some of our regulars become complicit in the racial discrimination.While it's not entirely unbelievable to see characters like Quark and Nog openly engaging in bigotry because the Ferengi are based on the ideals of Western society many of us are actually forced to live in and I certainly understand the ineffectual and nativist Bajoran Provisional Government acting the way they do, I'm less comfortable with the weak response Major Kira gives. To me, she should be the one proudly and openly welcoming the Skrreeans, recognising them as comrades given their similar histories. The provisional government could still turn them away, but instead of siding with them Kira should have gotten angry and given them a lecture about being hypocrites and forgetting their roots. I'm also not really satisfied with the hands-off approach of the Starfleet crew-You'd think if nobody else Miles O'Brien would have some words to say about the Skrreeans given his own people's history. However, both Commander Sisko and Jadzia Dax do get a few choice moments. Once more, Star Trek has forgotten that it can't just get on a podium and rant about things, it actually has to offer actual solutions to real problems. More importantly, it has to demonstrate what a world where “Issues” such as these have either been resolved or, at the very least, how they can be resolved...Constructively. Yep I would have really preferred seeing Kira really argue for the side of the Skrreeans, would have been a perfect fit for her character. The whole story just paints the Deep Space crew as basically standing back and letting a bad situation stay bad.